I ponder if Emily Post ever considered writing about this subject. It is very common for those producing the technical aspects of a show that we communicate via a headset system. There are a million opinions as to how this should be done and also as to what rules should be in place to bring the communication to it’s best possible out come. I have recently designed a production in an educational setting and clearly a reasonable headset protocol was not being followed and I pondered the question if it had been taught. So this is my attempt to bring up the subject. Hopefully this will be useful to many and freely shared. The purpose of headset communication is for appropriate instruction to be given in a clear and concise manner. For this to occur, people who are to receive this information must actually be on the headset and listening. Here are some rules that I believe should apply. 1 – Always be on headset if you are to give or are to receive instruction. 2 – Have your microphone off unless you need to speak. This limits the addition of extra unnecessary noise. 3 – If you are leaving the headset announce that you are leaving and announce when you have returned. 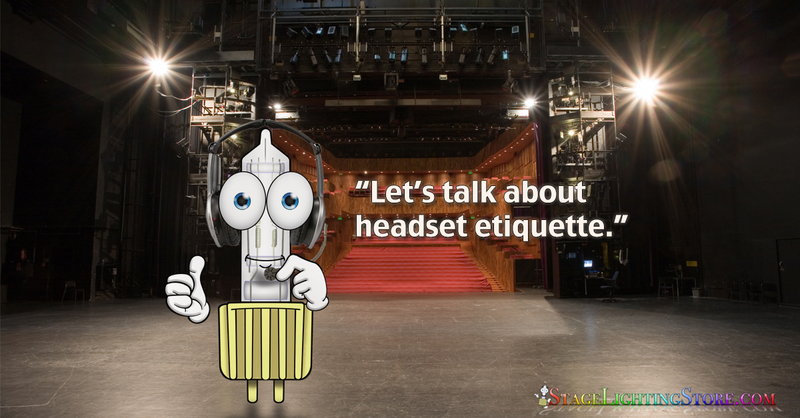 4 – If you are placing your headset down make sure that your microphone is off. 5 – If you ever have to unplug your headset, announce and make sure your microphone is off. The unplugging can cause a very loud sound and damage the ears of those who are on. 6 – Be polite and use good judgment about not interrupting something that is being said that is important. 7 – If quiet is being called for, obey. Just as in life, common sense of social interaction will go a long way.